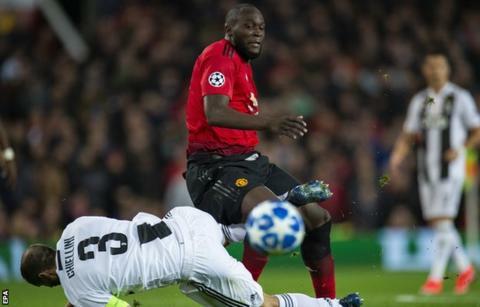 Manchester United manager Jose Mourinho says Romelu Lukaku is lacking in confidence but "the goals will arrive" for the Belgium international striker. Lukaku scored four in his first five games this season but has failed to find the net in his last eight matches. Paulo Dybala scored the only goal as United were beaten 1-0 at Old Trafford by Juventus in the Champions League. "No criticism at all," Mourinho said regarding Lukaku. "But I have to agree his moment is not sweet." Ex-Chelsea and Everton striker Lukaku has five goals for his national team this season, one more than he has for his club. He said before the game that he is "working on" improving the "teamwork between myself and my team-mates" and results will come when "it starts clicking". After joining the Red Devils from Everton for £75m at the start of last season, Lukaku ended the campaign as the top scorer, netting 27 goals in all competitions. "But he is our striker and he a is a good striker we believe in. Could I play Rashford there? But then I don't have a winger as in this moment we have a difficult situation. Serie A champions Juventus are top of the Italian league again with an unbeaten record this season, winning eight of their opening nine games. They dominated much of the game against United, who are 10th in the Premier League, with Dybala's first-half goal from Cristiano Ronaldo's cross enough for victory. Although Paul Pogba struck the post for United in the second period, the Juventus defenders were largely untroubled for the 90 minutes. 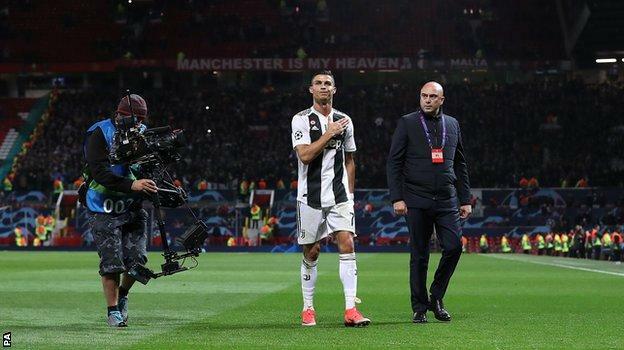 Former United defender Rio Ferdinand told BT Sport: "Every single Juventus player will come off the pitch and say 'wow I was under no pressure today'. "The team at home were playing like the away team, Juventus were pressing them rather than the other way around. "If I went out on a home game and I was told to sit back and retreat I'd be shocked, I'd be thinking 'really? this is Manchester United'. If that's the tactics they've been told before they left the dressing room then I'd be shocked." "If you were having to describe this game short and sharp, it's men against boys. There was a huge difference between the sides on quality on the ball they were bossed today." Former United midfielder Paul Scholes said: "Juventus look like a side that's been playing together for a while - they were a class above United. Juve look like a team who can go on and win the Champions League." Asked if Mourinho should be replaced, Scholes replied: "No I wouldn't. He has a great record, he has been at big clubs, won massive trophies. He did it in the first year. "It has been a struggle since then. I think he has the experience to turn it around. In the last few weeks his attitude has been better toward players. But he added: "I think when you get into his third year you'd like to see an improvement year on year. A way of playing, an identity, I don't see what they are trying to achieve." Mourinho heaped praise on Juventus - notably defenders Giorgio Chiellini and Leonardo Bonucci - and pointed to the Italian club not being satisfied with seven consecutive league titles. Asked how his side could reach the same level, Mourinho referenced other elite clubs including Barcelona, Real Madrid and Manchester City, claiming investment is required. "It's not also easy because many of the players they belong to these top teams," he added. "So we work with what we have, try to improve what we have. Today, I have to say Chris Smalling and Victor Lindelof had a very positive game. I think it's the first time Lindelof played a game of this dimension. "We work, we work hard, try to improve our players but quality is quality. Quality in football is everywhere. When I say quality I don't just say creative players, Chiellini and Bonucci, it is absolutely beautiful to see."